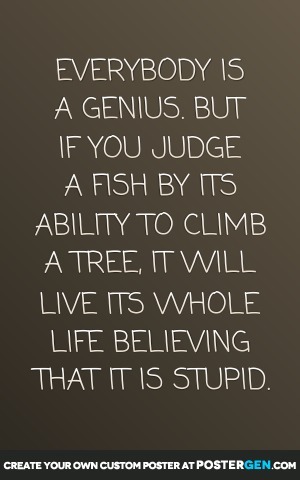 There is a quote that says, “Everybody is a genius but if you judge a fish by its ability to climb a tree, it will live its whole life believing it is stupid.” That quote is sometimes attributed to Albert Einstein although it is uncertain whether he coined it or just repeated it. At any rate he lived the quote. He didn’t speak until he was four years old and didn’t read until he was seven and eventually was expelled from school. Some of his teachers actually thought he was mentally challenged. There is evidence that other famous scientists and inventors struggled in school. Thomas Edison, Isaac Newton and Charles Darwin were all below average students in formal school settings. Winston Churchill failed the sixth grade. Woodrow Wilson didn’t read until he was twelve years old. Orville and Wilbur Wright both suffered from depression. What does all this have to do with the purpose of education? If someone was looking at our education system in the United States they would probably conclude that our goal and purpose is to teach every student to learn the same thing in the same way and if they don’t then they are labeled as slow or below average. In my opinion we need to work harder and finding out how student’s learn and what they are gifted to be. Let me share something I saw from the 2008 Olympic Games. NBC did an analysis of Michael Phelps which explained why physically he had the perfect body to be a swimmer. With long arms, relatively short legs and big feet he was literally born to be a swimmer. Most of us would agree that there are other athletes that were born to play their sport. Michael Jordan, LeBron James and Tiger Woods are just a few that come to mind. Some of you will remember when Michael Jordan tried his hand at professional baseball. He was a good player but far from the best. My thought as I was watching this piece was, what a tragedy it would be if Phelps had never gotten the opportunity to be a swimmer or if Michael Jordan had never played basketball. The difference was between being good and being the best. How many times have students in our schools been dismissed or left behind because we didn’t find the best place for them to fit in or we tried to make them fit into a role they weren’t ready for. One of our main goals of education should be to help students find their strengths and gifts and help them build those strengths and skills. In order for this to happen we as educators have to be open-minded and flexible. In our current system we try to put everyone in the same classes and take the same tests on the same timeline. We do all of this while trying to prepare them for a diverse world. It is no wonder that many students, teachers and parents are frustrated because we are not allowing for the truth that everyone is different. Student’s that don’t succeed in the current system take on the perception that they “aren’t good enough.” Instead of exercising so much energy on student weaknesses, let’s focus that energy on what makes them strong. This could take more work, more preparation and more time but it seems to me that the benefits far outweigh the investment. The past two days I have been in a training that is supposed to help us become a better school and be more efficient and effective at teaching school. Like most teachers that want to truly help kids, I love good training that can help me do my job better and this was a good one. One thing that the presenter kept saying was, “When did it become OK to cheat kids out of an education?” Now I have to admit that I am an idealist and an optimist. I always think that all of my students are going to succeed and learn. I maintain that this is true although not every student will learn at the same rate or in the same way. But it is up to us as teachers to find a way to help them find who they are and how they learn best. I think one of our most important jobs is to help students find out their gifts and what they are good at. But we cannot cheat them by giving less than our best. Now teachers are human and sometimes we have bad days just like everyone. On those days our best may not be much but we can still give our best no matter what that is. As professionals I believe it is our duty to do our best and do what is right because it is the right thing to do. I’m glad that I had this training here in the middle of June so that I can use the rest of my summer to do some planning so I can be y best when school starts back and I might be able to help another teacher along the way as well. I am going to take a day off before beginning the Turning 50 theme because I want to take a moment to recognize people that I truly love; my fellow school teachers. As most of you know I have been a teacher since 1988 and of course I have met lots of teachers during that time. In the past week or two here in Texas, all of my teacher friends have been celebrating the last day of school. If you heard a loud cheer in your neighborhood it could very well have been all the teachers letting you know that the school year was OVER! I love teachers but I will be the first to say that there are some teachers out there that don’t do their job well and and some that have stayed too long and need to hang it up because they have forgotten why they are there. But for the most part, the teachers I have had the privilege to work with are awesome and I love to be around them. I am going to dedicate this entry to all those teachers I know that do their job and do it well. Most teachers I know are dedicated, full of passion and love the students they teach. Most of them do what they do without alot of recognition or support and many times in the midst of criticism but they do their jobs because they they are true professionals. Teachers have to take on many roles during their workday. We are disciplinarians, counselors, food distributors, custodians, entertainers and referees. We have to know how to work all kinds of audiovisual equipment as well as be an expert on all computer programs and software. I really think teachers are well prepared for jut about any job and any stressful situation. They learn to be problem solvers and many time have to be MacGyver when they are forced to “make do” with minimal supplies and budgets. Teachers have a habit of becoming hoarders and scavengers because you never know when you might need something for the classroom. All in all I love to be around teachers because they are sincere and loving people. So here I take my hat off to all of you teachers. May you continue to inspire and teach young people ll of your life!